Mom’s recipe grew out of early marriage memories made during my parent’s first trip back east. While I was there too, I was not yet a year old. So it was seven or eight years later that I first heard the story of how we once stayed at a small Vermont roadside motel with a nearby restaurant. Mom recalled that the tables of the quaint restaurant were covered with red and white checked tablecloths. And there she and Dad enjoyed a dish of spaghetti and meatballs. I’m not sure whether it was Mom’s first taste of spaghetti, but I know it was this meal that inspired her to recreate the sauce from memory. Her recipe was simple. She served it anywhere and everywhere. She served it in her home to large family gatherings, it was her favorite take-out bereavement meal and she would often package up leftovers to send home with her youngest grandchildren Abigail and Annie. It was my father’s favorite meal. Perhaps it’s the memory of Mom that lives out in my own life that causes me to give away this meal to others. I’m not really sure. But in January this year, I prepared it for a couple of master gardening friends in recovery from orthopedic surgery. 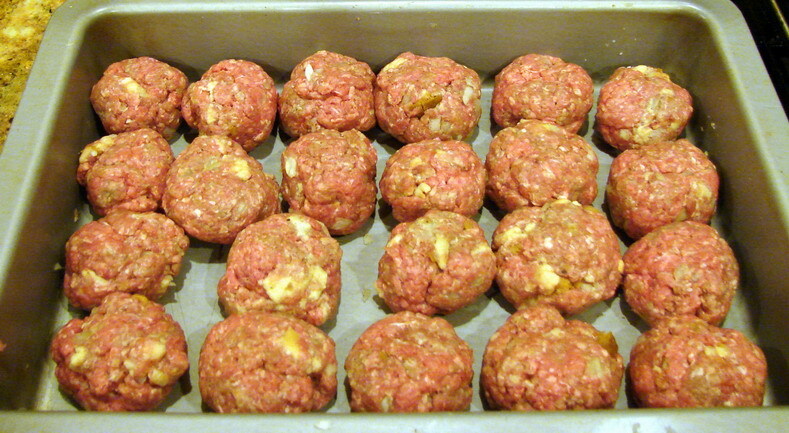 And this Christmas season, I’ve made a couple of batches as gifts for a few special folks in my life. As with all the best recipes, Mom’s recipe is splattered with who knows what ingredients from years of much use, though I’ve used another recipe for almost 10 years now. Yet, I still make Mom’s meatballs; I smile at the memory of once calling them light bulbs, not knowing the difference between one label and the other. And really, there is truth under this childhood memory — because no matter what ingredients and labels are used, a gift of a home-cooked meal is about love beyond all else. Both sauce recipes are included for the sake of posterity. Enjoy either or both — from my life to yours. Mix together and form into flattened golf-size balls. Mother cooked in a skillet over low heat until done — I cook mine in a 9×13 pan in a 350 oven for an hour. 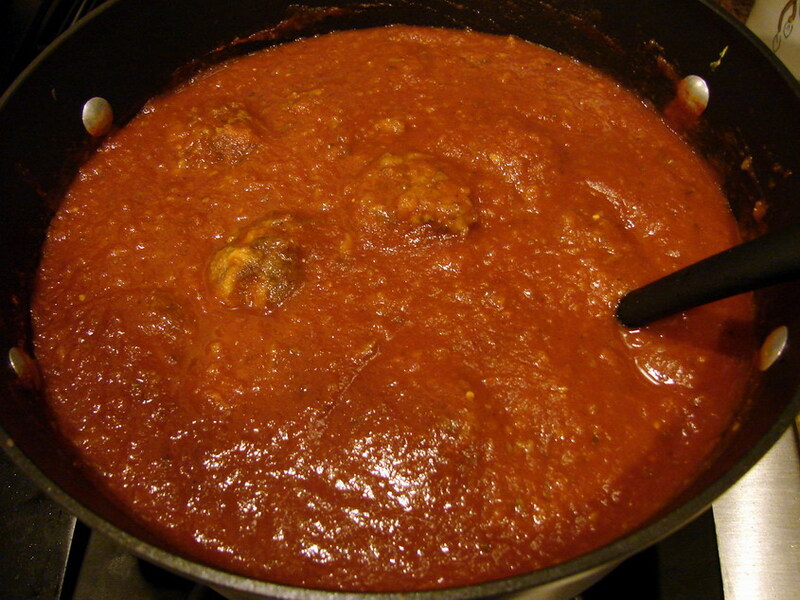 When cooked through, drain and add to sauce as it cooks. Handwritten recipes are so special. I have some from my great-grandma that I keep in a wooden recipe box. I will have to give this a try. I’ve been craving old fashioned spaghetti and meatballs a lot lately. 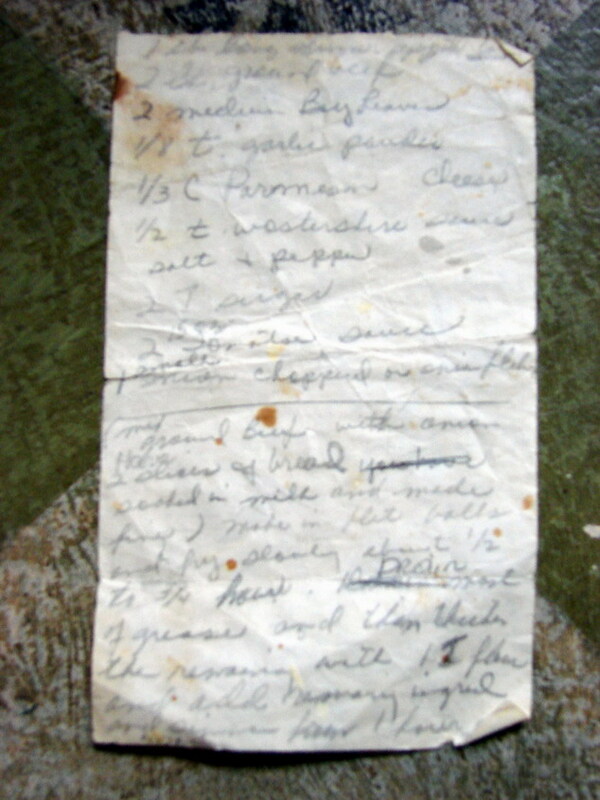 How special that you have handwritten recipes of your great-grandmother. I have my maternal grandmother’s cookbook, but never knew either of my greats.